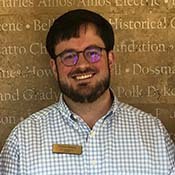 Coleman Hampton is Executive Director of the Bell County Museum in Belton, Texas. The native Texan holds a Bachelor of Arts in History and Master of Arts in Museum Studies from Baylor University. His position at the Bell County Museum began in February 2017. Since assuming leadership of BCM, Coleman has worked to increase audience focused programs, create an inclusive museum environment, and build lasting relationships with regional schools. Coleman is Chair of the Brazos Trail Region, a non-profit entity partnering with Texas Historical Commission to increase heritage tourism across the state. He is also Chair of Prehistoric Texas Trails, and a member of the Bell County Historical Commission and Temple Rotary Club. Coleman is a proud museum and preservation advocate, making regular presentations to groups and elected officials on the importance of museums in society.